As a rule of thumb, you should always be A/B testing something on your landing pages. Every click is not only an opportunity to get another conversion, it’s also an opportunity to learn something about your audience. How does this page element affect conversion rate? How do changes to this page element affect conversion rate? How does my page layout affect conversion rate? How does my copy affect conversion rate? How do my images affect conversion rate? How does my form affect conversion rate? Answering and optimizing for each of these points takes a lot of planning and testing, but if you’re new to A/B testing or simply facing “tester’s block”, creating an effective testing strategy can be quite a challenge. With that in mind, I’ve outlined some of the key components of a great A/B testing strategy, along with some testing ideas to help you improve your conversion rate in each area. Sometimes, your landing page just isn’t right for your audience. Maybe it isn’t a good match for your ads, maybe your value proposition is unclear, maybe your design just doesn’t gel with your traffic. In many cases, you might not even realize that your landing page doesn’t work for your traffic, which is why it can be helpful to simply try something completely different. This can particularly useful if you’ve got limited traffic to your page. The bigger the change, the bigger an effect it will likely have on your conversion rate, which means the winning page design will be obvious with a lot fewer site visits. If you need ideas for your bold new landing page design, check out these examples here. If you are launching a new campaign and are planning to use an old standby for your landing page design, build your new design and launch both simultaneously. Splitting your traffic between the two will allow you to quickly see which page is the winner. Alternatively, you could try creating two brand new designs and see which performs better. Once you have a winner, you could try split testing the victor against your old design to see which is the true winner. As an alternative, you can start with the old standby, do a little optimization to get it converting and then introduce your new design. This has the advantage of ensuring that you don’t end up with two non-converting landing pages, but it does slow the learning process a bit. Depending on your situation, either approach can be a good way to check the overall effectiveness of your current landing page design. You might already be using the better layout, but you won’t know until you try something else. Getting someone to act on your call-to-action is the ultimate goal of your landing page, so it’s a must for A/B testing. Simultaneously creating a sense of value, establishing what will happen when they convert and urging the user to take your desired action is no easy task. Consider changing from a more generic phrase like “Learn More” to something like “Speak With An Expert.” The clearer your CTA is, the more effective it usually will be. Test it and find out! The importance of button color to conversion rate has been the subject of a lot of online ridicule and debate, but the fact of the matter is that—for some companies—changing button color has produced impressive results. It might not be a guaranteed win, but that’s why you run tests. At a minimum, your button color should stand out against the rest of the page. Where you put your CTA may have a big impact on your conversion rate. For some pages, putting it above the fold may be important. Other pages may have traffic that wants more information before you hit them with a CTA, so it’s worth A/B testing to see how a below-the-fold CTA works for your page. The design of your CTA can actually affect your conversion rate. Simple changes, like rounding the corners or adding a shadow or gradient are easy to test. You also might consider adding imagery (say a picture of the product they will be buying) or some sort of trust seal to make your CTA more compelling. If you have a long landing page, it might be worth it to add a CTA or two further down in your page. Or, you could try adding a sliding sidebar CTA or a CTA to your sliding header. 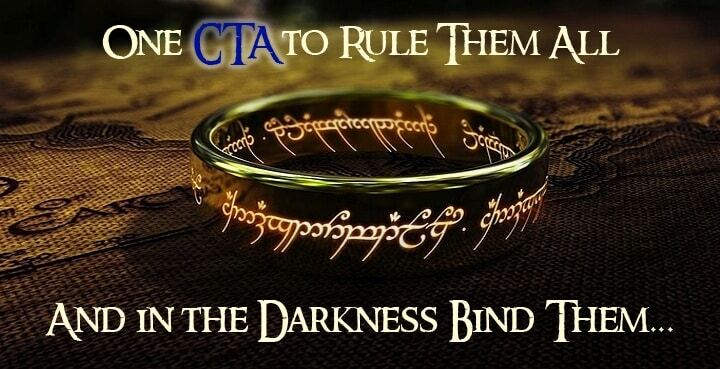 This isn’t Lord of the Rings, there’s no “One CTA to rule them all.” Test different CTAs until you get a combination of elements that really works for your audience. If the goal of your landing page is to get people to fill out and submit a form, then A/B testing form content and design is another absolute must. There’s a lot of debate out there about form best practices, but there really isn’t any way to know what sort of form will work best for your audience. To really optimize the performance of your form, you’ll want to test several variations. Along with CTA optimization, form optimization is one of the first things you should be A/B testing on your landing page. You don’t want them to click on your CTA only to lose interest while filling out your form! A picture is worth a thousand words and, in this case,it may be worth a thousand conversions. Changing up your hero shot is a minor change that can produce major results. Traditionally, your hero shot is what grabs a user’s attention once they land on your page. Emotion of your hero shot. Does your hero shot convey happiness? Satisfaction with your product or service? Frustration with a pain point? Try changing it up and see what happens. Subject matter. Using a stock photo of a happy person? Try a cityscape, snapshot of an actual user or your product in action, flat art or even a solid color! Race/Culture. Depending on your product or offer, certain races or cultures may identify better with certain images. For example, if you are selling menorahs, pictures of a cozy African-American family sharing a Happy Hanukkah experience may not resonate very well with your target audience. Seasonal images. Is it winter and your hero shot shows people standing outside in shorts? Consider trying a seasonally appropriate image or, if you’re trying to sell how awesome a season-specific product is, consider contrasting the current season (for example, winter) with the seasonal benefits of your product (ie, happy people swimming at your resort in summer weather). Product images. Do your product images make it easy for your audience to envision themselves using it? Test different types of pictures of your product—in use, free-standing, with happy users, etc. Your hero shot and other landing page images are relatively easy to test and they can have a big effect on your conversion rate, so try changing things up! Your headlines and body content are a key part of your messaging. Essentially, there are two key areas you should look into testing. Headlines are the part of your content that your audience is most likely to read, so these need to be succinct, compelling and on point for your messaging. Try testing out headlines with industry buzz words against headlines advertising an offer to see which does a better job of grabbing your audience’s interest. However, if you are only changing your headline, you need to make sure that your new headline is consistent with the rest of your landing page—otherwise you’ll need to adjust the rest of your page, too. How much do you really need to say? Sometimes a shorter page works better. Other times, you really need to explain more to convince people to convert. Try A/B testing various amounts of text or discussion points to see what works best. In addition, consider changing the layout of your content to see if that affects your conversion rate. Your audience may be interested in or need to be reassured by a specific point earlier on the page, so changing where and how your information is presented can significantly affect conversion rate. A/B testing is one of the best ways to improve the performance of your landing pages and marketing campaigns. But, to use A/B testing effectively, you need to have a great testing strategy in play. Between testing major changes, your CTA and forms, hero shots and copy, there is a lot to keep track of and plan for, so use this article to set yourself up for success. By the way, if you’d like me to go over your landing page testing strategy with you, let me know here or in the comments! I’d be happy to help you get your testing working right. Do you have any suggestions for landing page A/B tests that you’d add to this list? Let me know in the comments!